Every nonprofit would love to enjoy the success of a marketing campaign such as the ALS Ice Bucket Challenge or the charity: water Thank You campaign. The success of these nonprofit marketing campaigns is not accidental. Each campaign intentionally followed a plan that was laid out in advance. Likewise, think of your marketing plan as a roadmap that’s going to guide you to a chosen destination. As with any journey, you begin with your destination in mind, and then start by charting your route from your starting point. There is no sense in beginning unless you know where you want to finish. Our goal is fundraising. Our marketing communications are donor communications. Our goal is member services. Our marketing communications are intended to nurture member engagement. Our goal is recruiting volunteers. Our marketing communications help manage volunteer experience. Our goal is trust. Our marketing communications will contribute to building trust between us and our constituents. How Do You Attract, Inform, Inspire, and Engage Your Intended Audience? Imagine that your goal is more than marketing. Instead, imagine that your goal is to build relationships through engagement, ultimately arriving at stewardship. Marketing becomes a means to that end. Marketing is too often a one-way, short-term, transactional exercise; relationships are built through conversations and interactions to engage your audience. Marketing may tend to drive one-time interaction; relationship-building encourages long-term engagement and stewardship. Marketing has the potential to be superficial; engaging your intended audience over the long run helps to develop deep affinity and meaningful relationships. Marketing is just one component of your comprehensive communications strategy. The most successful nonprofits focus on nurturing relationships; employing a marketing plan and applying it to specific campaigns is part of an engagement continuum. An engagement continuum is a series of touch points between you and the intended audience whom you are trying to reach. Your marketing plan must attract, inform, inspire, and engage donors and stakeholders. Along this continuum, you will find what you consider to be “marketing” will decrease, while relationship-building will increase. A marketing plan is the path you and your audience follow to arrive where you nurture and steward the relationships formed along the way. Strategy helps you begin the journey; a marketing plan serves as a map to guide you to your destination. Think of your marketing plan as a matrix woven from the elements of Motive, Message, Market, Medium, Method, and Means. Each element can exist independently, but together they are robust and cohesive. Motive: What is the purpose for your marketing plan (beyond “the board says we need one.”)? Why are you conducting this campaign? What is the goal of the campaign or plan? Message: What is the call to action? What is the one message you’re conveying, the story you’re telling, or narrative you’re supporting? Market: Who is the intended audience you’re trying to reach or persuade? Who are the partners, advocates, and ambassadors that can help amplify your message? Method: Based on your goals and purpose, when will you launch the campaign? Will it be interpersonal or conducted through media? Where will you conduct the campaign? Medium: What platforms or communication mediums will have the most success in reaching your intended audience? What specific touch points have the most potential to reach your audience with the message and content you want them to engage with? Means: How much will this campaign cost? Understanding and investing for success will help you measure the return on your investment. Before you get overwhelmed with creating a comprehensive marketing plan for your organization, consider the establishment of micro-plans that help you focus on specific goals to achieve. These micro-plans can be campaign-specific or audience-specific; together they will form a complete marketing plan. If you begin with the idea that you are creating a marketing strategy, and not only executing a marketing plan, you will align your goals with an essential foundation through a smart, tactical communication plan. Above all else, remember the rule of one: focus your communication on one cause, one mission, and one purpose, sharing that purpose with one voice. Begin by asking the following questions. As you do, you can fill in your answers following the same framework. Motive: What Is Your Purpose and Goal? A marketing plan must be relevant to the purpose for which you’re creating it. Raising awareness and raising funds are two different primary objectives (even though they are complementary to each other); attracting new donors and marketing an event requires different strategies and tactics to achieve your goal. What Is Your One Message? What is the one message you want your intended audience to remember? What is the one story you’re sharing in which you want your audience to engage? What is the one call to action you want your audience to answer? Who is the primary (intended) audience you’re trying to reach with this plan? (Remember that everybody is not your audience. Think of the one person who best represents the audience you’re seeking to reach and keep them in mind as you create the strategy. Who might help you reach this audience? Are there partners with whom you have alliances? What other groups, ambassadors, fans, and advocates share your enthusiasm for your cause and can help reach your intended audience? What Methods Will Be Relevant? Effective marketing plans are not conceived and executed in a short time. Plan at least three months out, and consider the timing and intersection of your message, market, and medium. Where will you conduct the campaign? Where is the most promising intersection of message, market, and medium? Will it require advocacy, public relations, digital, print, or traditional advertising? When is the right time to conduct your campaign? How long should your campaign run? When must you start planning for a year-end campaign? How frequently should you share the message? Do you need to create content (such as a blog article, event page, or landing page) in anticipation of tactical planning? Which Mediums and Touch Points Will Help You Achieve Your Goal? It’s tempting to begin planning the tactics at the beginning of a marketing planning process, but as a communication professional, you will remind your board and executive management that planning precedes doing. How you reach your intended audience begins with creating meaningful content (i.e., your message) that you share using specific touch points. Think of a touch point as the point (or intersection) where your message and the medium you use to deliver that message touches your intended audience. The effectiveness of your touch points is dependent on the quality of your content. It’s easy to be overwhelmed with the number of touch point choices available to you. If you know you can reach your audience through Facebook and email, why spend the time with Twitter if it’s not going to help you achieve your goal? For example, after analyzing the effectiveness and reach of its current Facebook, Twitter, and email list, a nonprofit society that relies on publication sales to fund its mission decided to focus on Facebook and email as its primary touch points. Twitter would be allowed to grow organically, recognizing that it is not an efficient way to reach and build its intended audience or sell its products. Key to success: Choose your media and tactical touch points based on where you will have the most success reaching your intended audience. Regardless of the touch points you select, all must be integrated—working together to achieve your marketing plan’s goal. Integration means that your messaging, marketing, and methods have continuity between the elements. For example, if you’re using a phone bank or a direct mail acquisition campaign to solicit donations and send potential donors to your website, the landing page content must match the appeal. Your method for collecting donations must create a straightforward and memorable donor experience. Content and Insight Marketing: Publish content on your website to inform and inspire your intended audience, drawing them into your cause and making them want to be part of your story. Social Media Platforms: The obvious choices of Twitter and Facebook are relevant if that’s where your intended audience is found. Snapchat, Pinterest, and Instagram may also have their place in your continuum if the platform is suitable for delivering your message to your intended audience. If it’s not relevant, focus on the platform that is. Print Media: Print remains an effective medium to reach your audience. Not only can print be disruptive in a digital age, it engages more of the audience’s senses than digital media. According to independent research from Sappi Paper, digital media engages sight and sound, but print engages sight, sound, touch, and smell—making your message potentially more memorable. Video: YouTube is a destination and useful for integrating video with email marketing and other digital media, but it’s just one choice. Consider how you can integrate Facebook Live, Twitter video, and Instagram video stories as additional video platforms. Google AdWords: The Google for Nonprofits program enables eligible organizations to qualify for up to $10,000 per month in Google AdWords. Let that sink in. A $120,000 yearly grant for digital advertising. If your organization hasn’t applied, what are you waiting for? 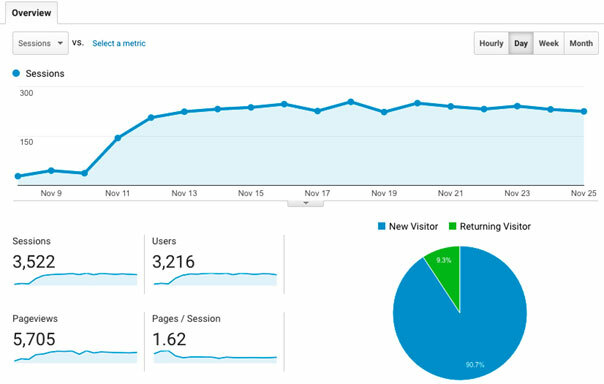 The nonprofit society mentioned earlier received a Google AdWords grant, and within one week of implementation realized an 860% increase in traffic to its website and a measurable increase in donations and product sales. Key to success: Integration between touch points allows you to measure and share content. For instance, Instagram is owned by Facebook. Images posted on Instagram are easily shared on Facebook and Twitter, including links to content. Custom or shortened links (created with bit.ly) allow you to measure engagement with any digital or print media. How Much Will Your Campaign Cost? The cost of any marketing plan must be measured in personnel time, creative investment, and media expenses. How much will vary depending on the extent of your marketing plan. Do not forget to consider the value of your investment as you evaluate your ROI (return on investment) and ROE (return on engagement). 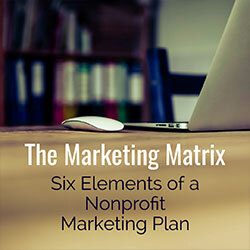 As a practical example, let’s apply the Marketing Matrix to a nonprofit society that sells products and literature to fund ongoing mission-based work. What is the one message to convey? The products and resources are easy-to-read and targeted to specific groups, making them easy to share and appealing to the recipient. What is the call to action? Visit to learn more, read examples, and purchase a product. Who is the intended audience we are trying to reach? Men and women in the continental U.S., aged 24-60, with strong alignment with the values of the organization, and affinity for the cause of the organization. Who are our partners, advocates, and ambassadors that can help amplify our message? Among Facebook and email communities, encourage sharing of motivational and inspirational messages based on our for-sale products. The society is engaged with its community on Facebook, Twitter, via email, and through a Google AdWords grant campaign. The most relevant methods are digital and social media, due to limited means for print-based marketing and the distribution of the audience across the continental U.S.
Measure of targeted URLs through Google Analytics conversion goals. What specific platforms or communication mediums will have the most success in reaching our intended audience, in order of priority? Email, social media, Google AdWords. How will we reach our audience with the message and content we want them to hear? Email to the intended audience directly two times per month, with a minimum of seven scheduled weekly posts to Facebook. Pause current Google AdWords campaign and create a new targeted campaign based on audience and product push. How much will this campaign cost? Email marketing: included in the monthly subscription of service and creative agency retainer. Facebook: Creative and social media management included in the monthly subscription of service and creative agency retainer. Google AdWords Cost: Allocate full $10,000 of in-kind AdWords support for 30 days ($329/day) to targeted landing page. Within the context of a strategic communications strategy, this campaign serves as one component of a 12-month marketing plan. Whether you think of a marketing plan as a roadmap or a matrix, beginning with the end in mind and including the elements of Motive, Message, Market, Medium, Method, and Means will ensure your plan is intentional, consistent, and cohesive. Brian is the founder of Aespire, (aespire.com), a digital agency that empowers mission-driven organizations to connect their cause with the community through branding, design, and marketing communications.Brian is the author of Amazon’s top-rated “Raise Your Voice: A Cause Manifesto,” a guide to help nonprofit leaders create meaningful branding and a culture of communication through design narrative and marketing communications. Read more from Brian at aespire.com/insights or connect with him on Twitter at @briansooy.